It’s notable that, according to most new sources, the top two candidates to replace Hagel — Michèle Flournoy, former under secretary of defense for policy, and Ashton Carter, former deputy secretary of defense — were frequently mentioned in the same breath as Hagel back in 2012 when Hagel’s predecessor, Leon Panetta, indicated he would step down for Obama’s second term. Regardless of Hagel’s successor, decisions about the aggressiveness with which the United States will pursue the Islamic State and other actors in the Middle East will still rest in the hands of the White House — with chief of staff Denis McDonough and national security adviser Susan Rice, despite their acrimonious relationship, and not with Hagel’s replacement or even with US secretary of state John Kerry. 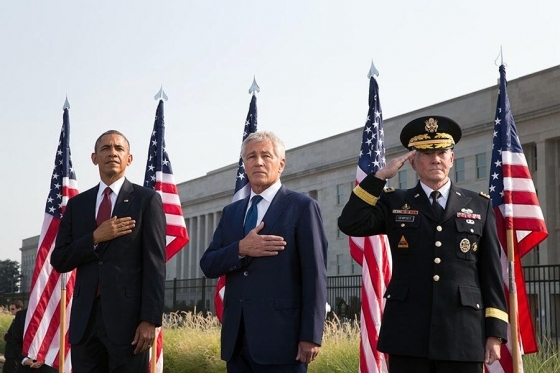 Showing the door to Hagel, a bipartisan symbol of policy restraint and realist skepticism, sends a clear message about the path Obama believes his administration will take in 2015 and beyond. But there was always a strong case that the critics were wrong, and restraint was the better course. The volte-face over ‘red lines’ gave way to a largely successful push to rid Syria of its chemical weapons stockpiles. Certainly, the blame for Islamic State’s rise has much more to do with both the failures of former Iraqi prime minister Nouri al-Maliki and with the historical divide between Iraqi Shi’a and Sunnis than with US withdrawal in 2011. Furthermore, Obama’s decision not to back rebels with military-grade aid in Syria has kept the United States from choosing sides between Sunni jihadists and Shiite forces backed by Iran, Hezbollah and president Bashar al-Assad. Nonetheless, as the United States increasingly engages Islamic State (the Obama administration doubled to 3,000 earlier this month the number of military ‘advisers’ deployed to Iraq), it will transform a fight between Shiite Iraqi leaders and Sunni rebels, or even between competing Sunni forces, into a more fundamental struggle of Muslims against the West. In so doing, the Obama administration risks elevating Islamic State to the level of a serious US adversary, a decision that US policymakers could come to regret in a decade’s time if (or when) an even more violent Sunni insurgency emerges, no matter who presides over the Pentagon in the last quarter of the Obama era.